Luke Caci is taking professional boxing in his stride as he prepares to make the trip for his next ring action. He will next step through the ropes on Saturday November 25 looking to continue his unbeaten start to life as a paid pugilist. He will lace on the gloves at the Imperial Banqueting Suite in Bilston, Wolverhampton, under manager and promoter Errol Johnson’s BCB Promotions. Caci has yet a drop a session in four points victories and scored 10-8 rounds against Andy Neylon and Curtis Gargano to the canvas, but a TKO has yet to come. The 27-year-old light heavyweight, who is from Newcastle-under-Lyme, is a fitness fanatic who is always in good shape. 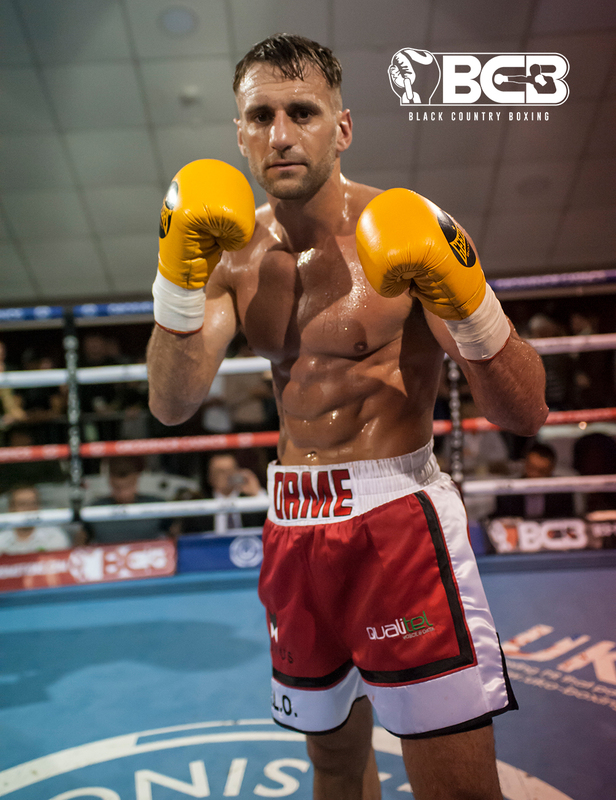 A graduate of Orme Boxing Club where he continues to train, Caci is also a keen runner and is determined to race into position for boxing titles. Someone’s ‘0’ must go for either Caci or his Brummie opponent Nicky Powell, who is undefeated himself after two wins from two bouts in the paid ranks, to prevail. “My next one is a proper fight,” Caci told bcb-promotions.com. “He’ll be coming to win so I’ll have to work hard to beat him. We will both put everything into it and that’s what I want. “I never put pressure on myself, I won loads of area titles as an amateur in England Boxing competitions and, come the national stages, I only lost when I felt like I was under scrutiny. Caci will have a ringside seat to see the Midlands crown contested at his weight as Ricky Summers and Joe Sherriff battle for the belt that has been dormant for nine years. Unsurprisingly, Caci is tipping stablemate Summers to pip Sherriff for the strap. “I’ve sparred with Ricky before,” Caci added. “We are mates and he’s always looked strong and sharp whenever I’ve seen him, so I’m expecting him to be too much for Joe on the night. Stoke cohort Nathan Heaney features on the under-card as do Jason Welborn and James Beech Jnr, who are both signed to MTK Birmingham, and Antony Woolery. Heaney and Woolery are debutants, with the former coming through Tom Lowe Boxing Club and hailing from Abbey Hulton. Welborn has held WBC International Silver and Midlands honours in two divisions and challenged for the British title twice. The experienced 31-year-old last downed Marcus Morrison on a Sky Sports televised card in March, which was at middleweight. Beech, a second generation fighter, has four victories from four outings as a super bantamweight, the last his first TKO over Russell Midgley in the third round. Standard tickets are still on sale, by contacting the boxers or online at iboxingtickets.com. They are priced at £35. £60 ringside have sold out. The Grosvenor Casino Walsall will sponsor the show and host the weigh in and after-show party (over 18s).